Bill O’Reilly continued to chime in on the Baltimore riots Wednesday night, saying the rioters were hurting Baltimore big time. The Fox News host said most black Americans “are honest, hardworking people” looking for economic opportunity. But he noted the horrible economic impact the riots will have on the city of Baltimore, in the form of lost revenue from cancelled conventions and the Baltimore Orioles game held Wednesday in front of an empty stadium. He continued to say opportunity can’t be created for “uneducated, disrespectful and unmotivated” people. O’Reilly then spoke to guests, asking a Reverend if Freddie Gray was responsible for his previous criminal record. Rev. Jamal Bryant called O’Reilly’s thinking warped, saying economic disenfranchisement didn’t start 72 hours ago in Baltimore and the criminals O’Reilly is railing against are at great disadvantage. 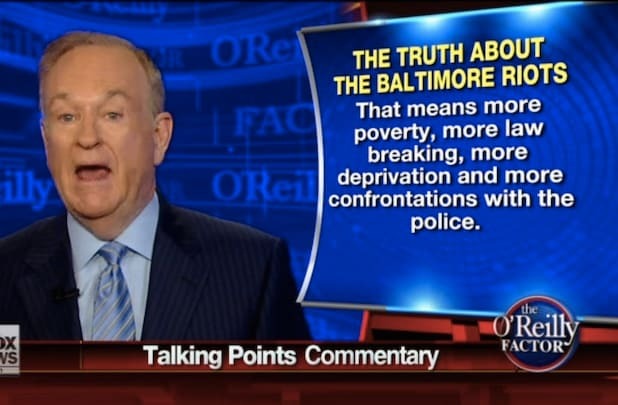 “Did you get out of it?” O’Reilly pressed him on lifting himself out of the dreary Baltimore economic situation. “I wasn’t raised in that zip code,” Bryant said.